The results of joint research between the JICA Research Institute and the Initiative for Policy Dialogue (IPD) at Columbia University were published in a book titled "Industrial Policy and Economic Transformation in Africa." On September 28, 2015, "Africa's Transformation through Industrial Development and Implementing Agenda 2063" was held in New York to commemorate the publication. It was organized as a side event of the U.N. General Assembly, and serves as a preliminary event to the 6th Tokyo International Conference on African Development (TICAD VI) to be held in Kenya in 2016. The event was hosted by JICA, IPD and other organizations. The distinguished participants were IPD Co-President Joseph Stiglitz (professor, Columbia University), UNDP Administrator Helen Clark and others. JICA was represented by then-President Akihiko Tanaka, JICA-RI Director Ichiro Tambo and JICA-RI Visiting Scholar Go Shimada (associate professor, University of Shizuoka). In his opening keynote speech, Tanaka emphasized the importance of Africa's industrial development for the "economic transformation" and "enhancing resilience," as well as the applicability of Asia's development experiences to Africa. 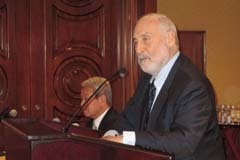 In his own keynote lecture, Stiglitz said TICAD has been quite significant to Africa's development. He then spoke of the importance of industrial policy in Africa citing the chapters contributed by JICA-RI Senior Research Advisor Akio Hosono and Shimada, as well as the problems caused by structural adjustments. Stigiltz also said there are many things to learn from Japan, an example of successful industrialization. In a panel discussion moderated by Ichiro Tambo, IPD Senior Fellow Akbar Noman (one of the editors of the book), New Partners for Africa's Development (NEPAD) Agency Chief Executive Officer Ibrahim Assane Mayaki, Ethiopian Kaizen Institute General Director Getahun Tadesse, Go Shimada and others discussed the direction of Africa's future industrial development, the role of TICAD and other issues. Attention was focused on Ethiopia's economic growth of over 10% per year, Ethiopia's efforts to promote Kaizen and JICA's assistance toward them. Some participants made comments such as "Africa should learn from Japan's experience of industrialization, technology, investment in human resources and education." 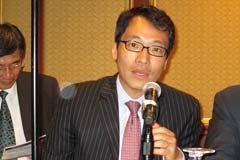 Keynote Speech at TICAD VI Pre-event, "Industrial Development in Africa and JICA's Perspective"